Fifth-grader Jackson has a problem. He is once again being visited by Crenshaw, a very large, bubble bath taking, surfboarding, umbrella-toting cat, who likes purple jellybeans. They’re Jackson’s favorite, too, but this cat simply cannot be in his life. Jackson is an aspiring scientist. He likes facts. Fact: Cats do not take bubble baths. Despite Jackson’s pleading, Crenshaw will not leave him. He first appeared four years earlier when Jackson’s parents lost their home and moved their two children and new puppy into their minivan. Life was tough, and signs suggest they’re getting tough again. Food is scarce. Rent is overdue. His parents argue a lot. When they start sticking price tags on toys, tables, chairs, and bed frames, Jackson knows the end is near. And he can’t fix any of it. He’s too ashamed to tell his troubles to even his closest friend Marisol, who appears late in the story, and infrequently, and often sounds more like a fairy godmother than a classmate. In part two, Applegate flashes back to life in the minivan. The author acknowledges the students and staff at the Monarch School in San Diego, a place exclusively for kids who are homeless or at risk of becoming homeless, where she conducted interviews for this book. While Applegate softens the cruel realities of homelessness with her characteristic wit, she makes her point, and this section is sobering. “If you ever have to live in your car, you are going to have some problems with feet,” Jackson tells us and lists stinky Dad feet; Magic Marker-y, nail-polish-smelling Mom feet; little sister’s kicking feet, and the “scratchy surprise of dog feet.” Jackson, then six, solved his foot problem by finding a cardboard box, just big enough for him to wriggle into, writing “kep out jacksons rum” on it, and sleeping inside. Despite the hardships endured in the minivan, Jackson counts his blessings. He met a kid whose whole family lived squished inside a Volkswagen bug. And Jackson’s box was inside the minivan, not out on the street. He’s not being optimistic, he assures the reader. These are facts. A bigger car is better. A box in a car is better than one on the street. The overall effect is heartbreaking. Crenshaw is back because he, of course, knows what’s happening to Jackson. As the inevitable move back into the minivan draws ever nearer and Jackson’s fear, and finally anger, increase, Crenshaw, deeply philosophical (but still a cat, he stalks frogs and torments the dog) delivers one overriding message: Jackson must tell the truth to the person who matters most. It takes Jackson a while to figure out who and what this is, giving readers a chance to think about it for themselves as they delve into the world of homelessness and its impact on children and families. 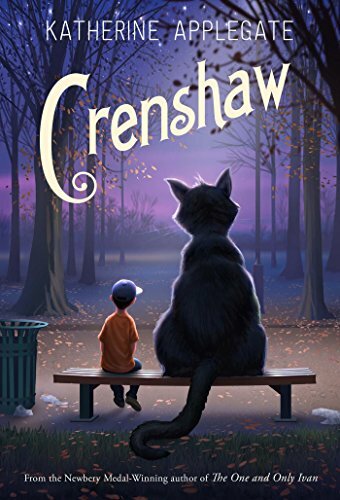 Crenshaw is at once a delightful tale about an unexpected invisible friend and an important book both for young readers secure in their homes and for those who’ve lost them. Katharine Britton's most recent novel is Little Island. Her screenplay, Goodbye Don't Mean Gone was a Moonbeam Film Festival winner. She teaches writing at The Institute for Lifelong Education at Dartmouth.